In children, the cartilaginous tibial tuberosity is an inferior extension of the proximal tibial physis. The tuberosity usually ossifies as an inferior extension of the main epiphyseal ossification center. Sometimes, one or more secondary ossification centers develop separately in the cartilaginous tuberosity. These eventually unite with the main, proximal tibial epiphyseal ossification center. Hence, the presence of multiple ossific nodules anterior to the tibial metaphysis is, by itself, a normal variant. The patellar tendon extends anterior to the infrapatellar fat pad of Hoffa and inserts into the cartilage of the anterior tibial tuberosity. The quadriceps femoris muscle, the largest muscle in the human body, inserts on a relatively small area of the tibial tuberosity. As a consequence, naturally high tension exists at the insertion site. In children, additional stress is placed on the cartilaginous site as a result of vigorous physical activity, leading to traumatic changes at the insertion; this is especially true in the case of activities, such as kicking, that involve particularly high stress at the insertion. The diagnosis of an Osgood-Schlatter lesion is usually made on the basis of characteristic localized pain at the tibial tuberosity, and radiographs are not needed for diagnosis. However, radiographic results confirm the clinical suspicion of the disease and exclude other causes of knee pain. Radiograph of a patient who is skeletally mature. Note that the tibial tubercle is enlarged and that an ossicle is present, with an overlying bursa. Image courtesy of J Andy Sullivan, MD. 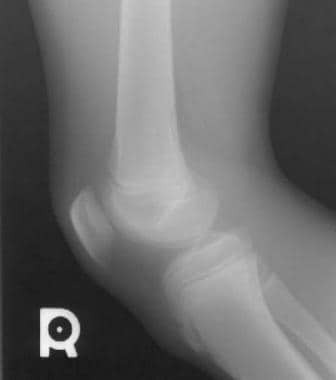 Radiograph of a patient who is skeletally immature. The tubercle is elongated and fragmented, and overlying soft-tissue swelling is present. Image courtesy of J Andy Sullivan, MD. For excellent patient education resources, visit eMedicineHealth's Osteoporosis Center. Also, see eMedicineHealth's patient education article Knee Pain. In the acute stage, edema of the skin and tissues anterior to the tibial tuberosity are present, and the edges of the patellar tendon may be blurred. The Hoffa fat pad may be edematous. If the tibial tuberosity is cartilaginous, no change is seen initially; after 3-4 weeks, fragmented ossification may be visible within the tendon. In the older patient, whose tibial tuberosity is ossified, linear or nodular avulsed bony fragments may be concomitantly visible with the soft-tissue findings, and a bony defect may be visible at the donor site. In the subacute stage, soft-tissue edema subsides. A previously visible avulsed ossific fragment may remain. New ossific opacities may develop in the injured patellar tendon. In the late stage, ossific fragments may unite completely to form a normal-appearing tibial tuberosity. If the fragments are dislocated, they may remain superior and anterior to the tibial tuberosity. If they fuse to the tuberosity, the fragments form a bony excrescence from the tibia that extends into the patellar tendon. Soft-tissue edema in the region of the tibial tuberosity, with thickening and indistinct margins of the patellar tendon, enables the diagnosis of active Osgood-Schlatter disease with a high degree of confidence; usually, radiologic confirmation of this diagnosis is not necessary. Accessory ossification centers may mimic findings in the late changes of Osgood-Schlatter disease. The radiographic differential diagnosis of multiple ossific opacities in the area of the anterior tibial tuberosity includes accessory ossification centers, which are normal variants, and late changes from a previous Osgood-Schlatter lesion. On CT scans, tendon enlargement and focal decreased attenuation at the insertion of the tendon on the tibial tuberosity are seen in the active stage. Distended deep or superficial infrapatellar bursae may be seen in either the active or late stage. An ossicle may be visible in either the active or late stage. 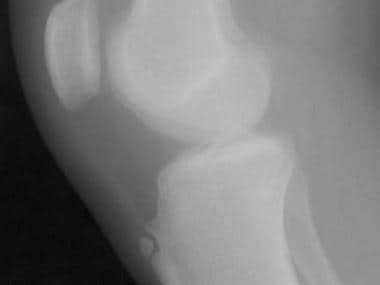 The donor site of an ossicle may be visible as a defect in the anterior tibial tuberosity. In the acute stage of Osgood-Schlatter disease, T1- and T2-weighted magnetic resonance images demonstrate increased signal intensity in the tendon at its insertion site. Distended deep and superficial infrapatellar bursae are frequently demonstrated. Ossicles are not depicted as well as they are on CT scans. Marrow edema may be seen in the tibial tuberosity and tibial epiphysis. In the late stage, signal intensity in the abnormal tendon and marrow edema may normalize. In some cases, thickened cartilage is seen anterior to the tibial tuberosity. Little information is available regarding the scintigraphic findings of the Osgood-Schlatter lesion. In a published series of 3-phase bone scintigrams that were performed in 10 patients, the findings were normal in all but 1 patient. In this single case, increased flow was seen at the time the symptoms appeared, and normal activity was depicted on delayed images. A follow-up scintigram that was obtained in this patient after the symptoms resolved showed a return to normal activity in all 3 scintigraphic phases. Dupuis CS, Westra SJ, Makris J, Wallace EC. Injuries and conditions of the extensor mechanism of the pediatric knee. Radiographics. 2009 May-Jun. 29(3):877-86. [Medline]. Rosenberg ZS, Kawelblum M, Cheung YY, et al. Osgood-Schlatter lesion: fracture or tendinitis? Scintigraphic, CT, and MR imaging features. Radiology. 1992 Dec. 185(3):853-8. [Medline]. [Full Text]. Maher PJ, Ilgen JS. Osgood-Schlatter disease. BMJ Case Rep. 2013 Feb 27. 2013:[Medline]. Czyrny Z. Osgood-Schlatter disease in ultrasound diagnostics--a pictorial essay. Med Ultrason. 2010 Dec. 12 (4):323-35. [Medline]. Vreju F, Ciurea P, Rosu A. Osgood-Schlatter disease--ultrasonographic diagnostic. Med Ultrason. 2010 Dec. 12 (4):336-9. [Medline]. Nakase J, Aiba T, Goshima K, Takahashi R, Toratani T, Kosaka M, et al. Relationship between the skeletal maturation of the distal attachment of the patellar tendon and physical features in preadolescent male football players. Knee Surg Sports Traumatol Arthrosc. 2012 Dec 22. [Medline]. Kaya DO, Toprak U, Baltaci G, Yosmaoglu B, Ozer H. Long-term functional and sonographic outcomes in Osgood-Schlatter disease. Knee Surg Sports Traumatol Arthrosc. 2013 May. 21(5):1131-9. [Medline]. Lee DW, Kim MJ, Kim WJ, Ha JK, Kim JG. Correlation between Magnetic Resonance Imaging Characteristics of the Patellar Tendon and Clinical Scores in Osgood-Schlatter Disease. Knee Surg Relat Res. 2016 Mar. 28 (1):62-7. [Medline]. Ducher G, Cook J, Spurrier D, et al. Ultrasound imaging of the patellar tendon attachment to the tibia during puberty: a 12-month follow-up in tennis players. Scand J Med Sci Sports. 2009 Mar 29. epub ahead of print. [Medline]. Suzue N, Matsuura T, Iwame T, Higashino K, Sakai T, Hamada D, et al. State-of-the-art ultrasonographic findings in lower extremity sports injuries. J Med Invest. 2015. 62 (3-4):109-13. [Medline]. Visuri T, Pihlajamaki HK, Mattila VM, Kiuru M. Elongated patellae at the final stage of Osgood-Schlatter disease: a radiographic study. Knee. 2007 Jun. 14(3):198-203. [Medline]. Lanning P, Heikkinen E. Ultrasonic features of the Osgood-Schlatter lesion. J Pediatr Orthop. 1991 Jul-Aug. 11(4):538-40. [Medline].